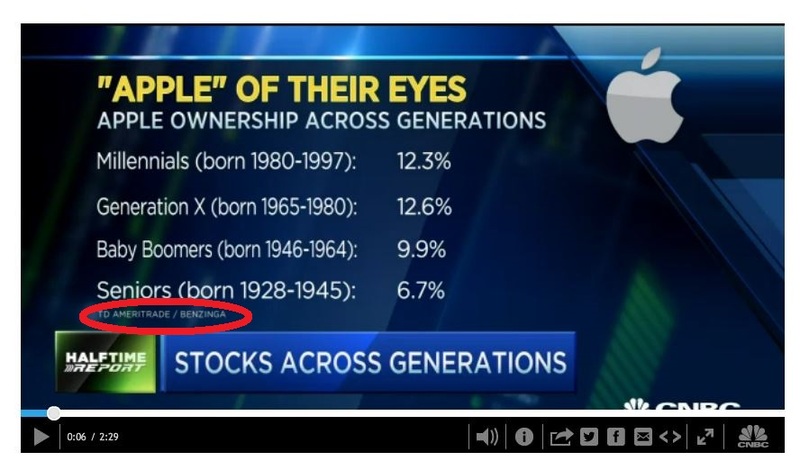 CNBC’s ‘Halftime Report’ Discusses My Generational Stocks Article! Since I started writing for Benzinga full-time, I rarely have time to make personal posts on Trading Common Sense anymore. However, I was so thrilled when I found out from my editor this morning that my recent article on generational stock picks was discussed at length on CNBC’s “Halftime Report” show that I had to add a personal note today. When TD Ameritrade sent us the statistics on generational investment, I had a feeling the piece would do well because the numbers were so fascinating to me personally. Apparently, CBNC found them fascinating as well. It was a really cool experience, and it was awesome exposure for Benzinga, which was mentioned by name and credited under the graphic that a talented CNBC intern most definitely created for the show. When I first started writing for Motley Fool, it was such a thrill to see something I had written get published there. Then it seemed surreal to see my Fool and Benzinga articles linked by CNN Money, Yahoo Finance, USA Today and other top financial news sites. However, I must admit that having my article discussed on-air on CNBC has been the coolest experience yet! For anyone who has not read the article, you can find it on Trading Common Sense by clicking here. To watch the video of the “Halftime Report” discussion, click here. I hope everyone has a fun and safe Memorial Day weekend! May 22, 2015 in Best of Trading Common Sense.